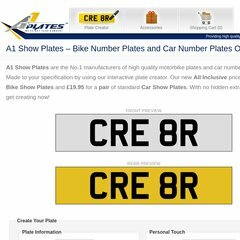 Topics: Plate Creator, Accessories, and Show Plate Accessories. The site has about 164 users daily, viewing on average 3.10 pages each. Its 3 nameservers are ns2.livedns.co.uk, ns1.livedns.co.uk, and ns3.livedns.co.uk. Its local IP address is 89.234.30.86.